Enjoy these exclusive promos/offers only when you book through the Chope website or app! To enjoy 20% off food bill (T&C Applies - Set menu, Chef Special & Lunch express or Promo not included), simply use the promo code CE20CSS every time you make a reservation via the Chope app or website. To enjoy *10% off and Free dessert, simply use the promo code CE10MAMRS every time you make a reservation via the Chope app or website. To enjoy *15% off the food and beverages bill, simply use the promo code CE15US every time you make a reservation via the Chope app or website. To enjoy 15% off the bill, simply use the promo code CE15RK every time you make a reservation via the Chope app or website. To enjoy 15% OFF, simply use the promo code CE15SNS every time you make a reservation via the Chope app or website. To enjoy *20% off the bill, simply use the promo code CEJPAO every time you make a reservation via the Chope app or website. *(Not valid on buffet. Valid for a maximum number of 10 pax per reservation). To enjoy *20% off the bill at El Machote, simply use promo code CE20WD every time you make a reservation via the Chope app or website. To enjoy *Free Dessert / Coffee / Tea, simply use promo code CEFDEM every time you make a reservation via the Chope app or website. *(Minimum order of one dish). To enjoy 10% off the food bill, a la carte menu, simply use promo code CE10LO every time you make a reservation via the Chope app or website. To enjoy *10% off the bill, simply use the promo code CE10QC every time you make a reservation via the Chope app or website. To enjoy *10% off food bill, simply use the promo code CE10BS every time you make a reservation via the Chope app or website. To enjoy 10% off total bill, simply use promo code CE10BBY every time you make a reservation via the Chope app or website. To enjoy 10% off the bill, simply use the promo code CE10WT every time you make a reservation via the Chope app or website. To enjoy 15% OFF bill, simply use the promo code CE15RSRT every time you make a reservation via the Chope app or website. You can enjoy a 20% OFF* on all Rock Shop merchandise with this booking. Simply using this code CE20RSM show this email and your dining receipt from this booking to avail the offer! - Discount available up to Rp 2,000,000. To enjoy 20% OFF Business lunch, a la carte menu, simply use promo code CE20YSIZ every time you make a reservation via the Chope app or website. To enjoy 20% OFF Business lunch, simply use promo code CE20TNC every time you make a reservation via the Chope app or website. To enjoy *10% off the bill, simply use the promo code CE10QN every time you make a reservation via the Chope app or website. To enjoy *15% OFF the bill, simply use the promo code CE15PLNR every time you make a reservation via the Chope app or website. To enjoy 20% off the food bill, simply use promo code CE20URO every time you make a reservation via the Chope app or website. To enjoy 20% off the bill, simply use the promo code CE20NLTA every time you make a reservation via the Chope app or website. To enjoy *25% off the bill, use the promo code CE25QN every time you make a reservation via the Chope app or website. *(Valid only for à la carte. Alcohol not included). To enjoy *15% off the bill, use the promo code CE15QN every time you make a reservation via the Chope app or website. To enjoy the gorgeous yummy *complimentary panna cotta, simply use the promo code CECPVA every time you make a reservation via the Chope app or website. 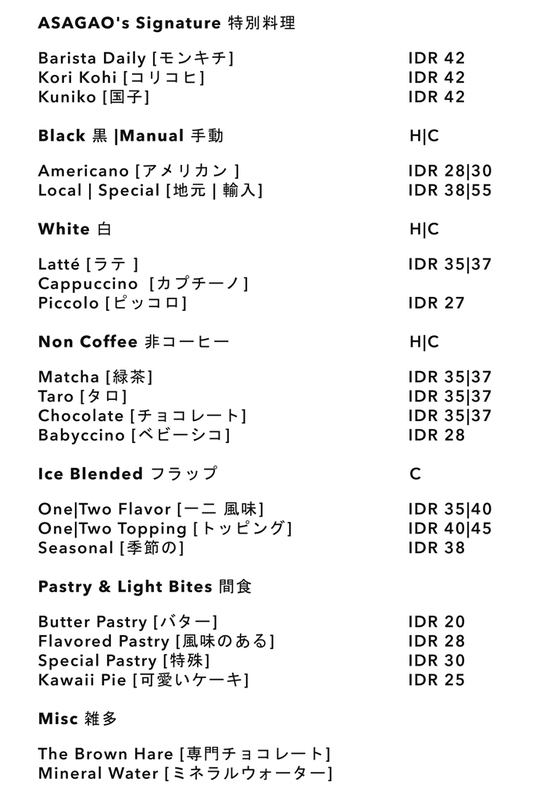 *(Minimum spend of IDR 500,000 on bill before tax & service. Two promotions cannot be combined). To enjoy *Complimentary Dessert of your choice at Emilie, simply use the promo code CECDEM every time you make a reservation via the Chope app or website. *(Minimum order of 2 main course ). To enjoy free Turkish delights or a free dessert, simply use the promo code CEFDTU every time you make a reservation via the Chope app or website. To enjoy Free Chicken Namban with purchase of 2 Set Bento, simply use the promo code CEISKR every time you make a reservation via the Chope app or website. To enjoy Free 1 coffee on selected menu with buy 2 pastry, simply use the promo code CEASGSO every time you make a reservation via the Chope app or website. To enjoy Free 1 Main Course with purchase first 2 main course, simply use the promo code CETYCF every time you make a reservation via the Chope app or website. To enjoy free 1 main course with purchase of 2 main course simply use the promo code CE8WCE every time you make a reservation via the Chope app or website. To enjoy Buy 2 Main Course get 1 FREE Main Course, simply use the promo code CEBRK21 every time you make a reservation via the Chope app or website. To enjoy Buy 2 main course free 1 light bites on pisang goreng salju, ubi fries, garlic fries and onion rings, simply use the promo code CEGRKAF every time you make a reservation via the Chope app or website. To enjoy free 1 dessert with purchase of 2 main course, simply use the promo code CEGRBC every time you make a reservation via the Chope app or website.